Q: How can I deskew (straighten) a document when scanning so that I can get a better OCR result? 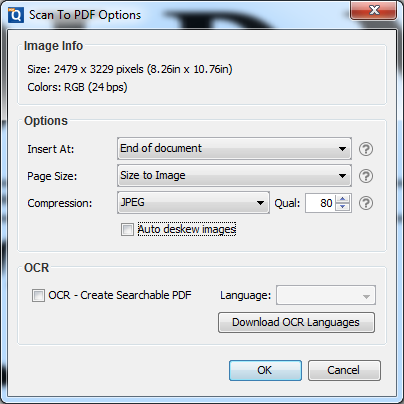 A: Starting in PDF Studio 12 (Pro) and above, you can deskew (straighten) a document on scan dialog. On scan dialog, make sure to check the “Auto deskew images” checkbox. See below for the scan dialog when scanning with WIA, TWAIN and SANE.